Its the time of the month for the new issue of the XTREME PSP Magazine to be released. 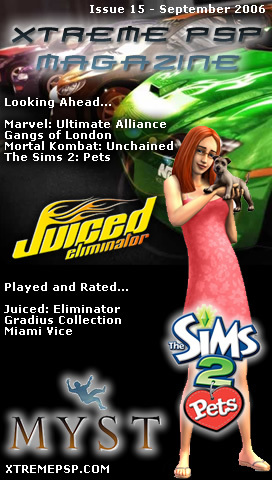 Issue 15 is packed with over 90 pages of great content including previews of The Sims 2: Pets, Myst and Gun Showdown, and reviews of Tekken: Dark Resurrection, Juiced: Eliminator and Miani Vice. And all the regular content including tips and cheats, the latest news, a new competition and more… Download it now.